One of the biggest reasons we hear people say they don’t have a solid web governance strategy is because they lack the time and money required to implement it. What they often don’t realize is that time and money are exactly what a web governance strategy saves. In this post, we’ll be presenting a few examples from industries who have already spent the time and money to discover the savings offered by web governance. Many local governments, service providers, and other organizations utilize self-service to reduce internal costs. This process is commonly referred to as "channel shift." When users can go onto your website and find the information they want, pay bills, and help themselves it frees your staff up to do other important things, saving you time and money. Banks offer an excellent look at the quantifiable difference that working self-service can make: A study conducted by TowerGroup Estimates found that the average transactional cost of online banking was just $0.20, while the average phone call cost $2.40. Simply by encouraging customers to use the self-service functions of their websites, banks can save millions of dollars per year. So what if you're not a bank? You probably still have self-service portions of your website. Whether it's hours of operation, your street address, or an FAQ, there's information helping users find what they're looking for. And if they can't find it, they'll call you for assistance - which costs you money. $2.40/phone call adds up pretty quickly. Colleges and universities live and die by their ability to recruit prospective students. According to a study by Noel-levitz, 20% of all college students report crossing a school off their list of prospective schools because of a bad experience with the website. Simply by having errors and poorly laid out content, colleges and universities risk losing up to 20% of their total prospective students and revenue. This same principle applies to any organization: For ecommerce sites, one British analysis concluded that the presence of even a single spelling error in an online store can cut sales in half. The following example is from one of our own customers: In 2012, BOSCH Communications signed on with us and spent the first month of their service fixing the broken links that had inevitably creeped on to their site. Most of these broken links were within the online content libraries intended to help customers utilize their products and services. The next month after fixing their broken links, their analytics program showed that the average time spent on their website had increased by 56%. Because they had not made any other significant changes to the website, the web manager attributes the increase to users no longer hitting dead links and giving up their search in frustration. This blog only touches the surface on the added benefits of investing and doing web governance right. Although implementing a strategy may appear daunting at first, it really needn't be. There's a great opportunity to give your users what they want and in turn reduce your service costs, particularly if your web governance strategy seeks to leverage present and future developments. 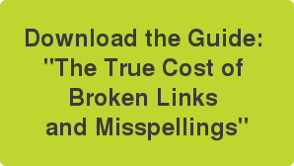 Download the guide "The True Cost of Broken Links and Misspellings".